Every chapter and verse of this translation is full of delightful surprises! We have Rev. Morford to thank for his dedication to the preservation of the original meanings of Hebrew and Greek words, and to presenting us with the original emotional tones and expressions that were intended to accompany the text. 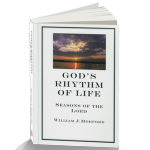 You will not find another translation that so powerfully reveals the “decisive and authoritative” aspect of our creator AND His “tender and relational” characteristics as well. 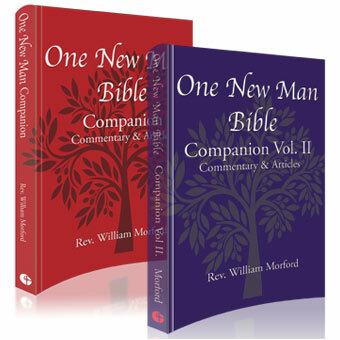 If you have been reading Latin based translations, you must read the ONE NEW Man Bible . Be prepared for a fresh encounter with a very powerful, very loving creator. You must read this Bible! 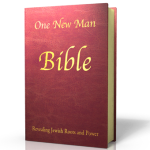 I LOVE THE ‘ONE NEW MAN’ BIBLE!! 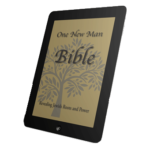 I’VE READ AND SOLD 28 CASES OF ‘THE POWER NEW TESTAMENT’ AND NOW HAVE THE ONM BIBLE FOR 2 WEEKS. THE GLOSSARY NOW HAS 137 PAGES AND, I BELIEVE, CONTAINS THE ‘MEAT’ OF THE BIBLE. IT HAS HELPED ME GROW AS A MESSIANIC BELIEVER IN YESHUA FROM THE SIMPLE TO THE HINT DEPTH (LOOK TO ‘BOOK ORDER’ IN GLOSSARY. Best bible I have ever purchased to date! Have been reading the different bibles (New Amer. Standard, NIV, etc.) for 38 years, this is the most awesome and up to date bible I have ever read. It helps so much to have the commentaries from a Jewish perspective. It gives you such a new understanding of what the meanings of many of the Jewish traditions are. For those of us who have no background in Jewish laws or traditions, it is a whole new world. 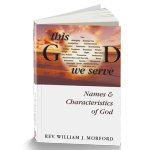 Thank you so much to William J. Morford for your insight and work. I love this bible!!! TRULY INSPIRATIONAL. THE INSIGHTS GIVEN IN THE GLOSSARY ARE AMAZING AND OPEN UP NEW LINKAGE TO OTHER SCRIPTURES. I AM SO THANKFUL THAT WE HAVE FOUND THIS BIBLE. WE HAVE PURCHASED 4 COPIES FOR OTHERS WHO LOVE THE LORD AND TRY TO LIVE ACCORDING TO THE SCRIPTURES. IT SHEDS LIGHT ON WHERE WESTERN INFLUENCES HAVE ALTERED THE CHURCH’S POWER. THIS IS A MUST FOR CHRISTIANS. GOD BLESS US AS WE ALL ARE TRANSFORMED IN TO “HIS” IMAGE. This is a wonderful bible that explains in foot notes Jewish roots of words or bible passages like no other bible I have read. A must have for those who want a deeper understanding of God’s word! Jesus means son of Zeus – Y’esua means son of Adoni. I always suspected that the bible translations were biased toward the western mind and life style. This version has me reading 4 times more than I normally do, not since I was a teen have I devoured the scriptures like this! It reframes my thinking into the proper Jewish context -how can we live the Christ life unless we think like Y’esua (Jewish). This will shake the very bottom of your faith setting it on a much more stable foundation! One incredible bible! 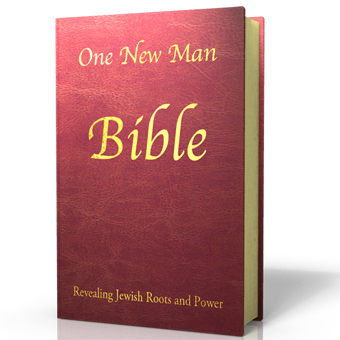 The One new man bible a tremendous translation as the author is a born-again Christian and has a immense background in the Hebrew and Greek language and their cultures. Praise the Father, our Lord Jesus and Holy Spirit for this Absolute Truth!! At last! May the Lord bless you. To do a very inadequate summary, this is the Bible/Torah with the blood and lies of English kings removed and the ancient Hebrew roots restored (and explained)with help from Rabbis. It really does open your eyes when it explains Hebrew customs and culture in the index. Not only that, it reads very easily and flows nicely. Whether you’re a Christian returning to the roots of the word or a Jew regularly reading the Torah, you will be blessed by this translation. This bible is written in the NOW tense, it is very powerful!! I love this bible! The type is crisp and black with a typical size font like you would see in a business letter. The pages are thin, and you can see the type from the other side of the page. This doesn’t bother me when I put on my reading glasses. (Slipping a piece of paper between pages does not help) Using my reading glasses does solve this problem for me. The pages are too thin for writing notes in the margins or for underlining (they also crinkle very easily)the publisher has provided white paper cardstock on the inside of the front and back cover and 4 clean pages of heavy card stock allowing you 10 pages total for permanent notes in your bible. After purchasing a copy of this Bible translation for myself, I went on to purchase several more copies as gifts for serious students of the Bible. The “glossary” is superb! While the informative material in the back is called a “glossary” because it is organized as definitions of the original Hebrew terms, it includes a great deal of historically and ethnically important information. For example, where most translations use the term “righteousness” this translation uses “lovingkindness,” which has a long explanatory section in the Glossary. The word “lovingkindness” includes the concept of action–of going beyond the basic expectations of the Teaching (Torah). The Glossary also includes an important and fascinating discussion of the concept of Torah as “Teaching” rather than “Law.” The One New Man Bible translation allows the reader to approach what is often stale material (stale from hearing the same staid opinions over and over) with a freshness and excitement that must have been real for early Christians. 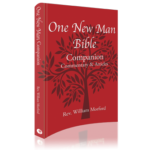 The One New Man Bible was given to me as a gift, and I LOVE IT so much that I’ve purchased it for others. If you want to read the Bible from a Jewish perspective, this Bible is easy to read, with lots of explanations, a good glossary, and literal and meaningful translation of the entire Bible. The translation of the “Lord’s Prayer” is insightful and meaningful for our daily walk; the understanding of the Jewish day starting the preceding evening is eye-opening in order to understand some of the Scriptures. I assure you, you will not be disappointed with this wonderful Bible. Beyond satisfied. I gave this bible to my brother as a birthday gift. He loves it absolutely. He said he has learned so much that you cannot get from the regular bible that many of us tote around. Let face it the Bible is a Jewish book and we can understand so much more when we learn the history, backdrop, idioms from that time. I have the New Testament for myself from the same author, it is a great study tool because along with the references at the bottom of the page in the back of the book you can get a wealth of study information. Yes, the pages are thin, but I would consider it barely minor problem when there is a wealth of information in the book. Hope this review helps you make a decision TO BUY The Book.